Beginning on a rainy and windy night, a series of murders begin at a fashion house in Italy. Beautiful young models are viciously killed by a faceless man in a trench-coat and fedora. Could it be that the killer is trying to hide secret information contained inside a mysterious red journal? This fashion house is built on top of an old castle and the dark dungeons below reveal that under the surface of glitz and glamour, humanity's base barbarism hasn't gone away. The civility and elegance are just beautiful window dressings to cover over petty lies and savage brutality. Suspicion reads across all the characters' sweaty faces as twisty plot machinations give way to gloriously imaginative bursts of violence. Having established a template for the giallo with "The Girl Who Knew Too Much", Mario Bava set about cementing its rules with "Blood and Black Lace". In doing so he created one of the most influential films ever made – an Italian classic that would spearhead the giallo genre, provide a prototype for the slasher movie, and have a huge effect on filmmakers as diverse as Dario Argento and Martin Scorsese. • Audio Commentary - in this exclusive new audio commentary, Tim Lucas, author of Mario Bava: All the Colors of the Dark, discusses the visual style and ambiance of Blood and Black Lace, some of the notable differences between the Italian and English audio tracks (such as the different names some of the characters are given), the alternative U.S. opening credits, the brilliant use of color, the effective misdirections in the film, Carlo Rustichelli's exotic score, etc. 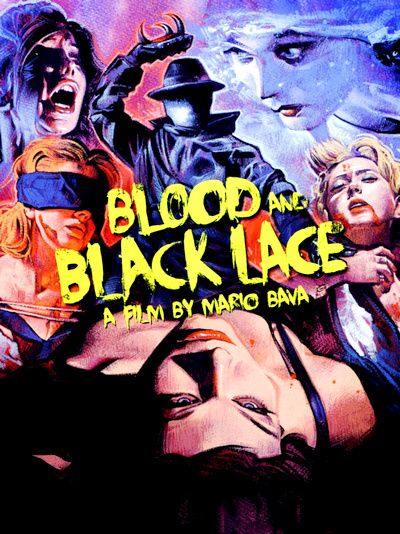 • Psycho Analysis - this documentary film focuses on the production history of Mario Bava's Blood and Black Lace and the origins of the giallo genre. Included in it are clips from interviews with film historian Roberto Curti, screenwriter Ernesto Gastaldi, author Carlo Lucarelli, film writer Steve Della Casa, and Dario Argento, amongst others. In Italian, with optional English subtitles. (56 min). • Helene Cattet & Bruno Forzani - in this short video piece, Belgian filmmakers Helene Cattet and Bruno Forzan (Amer, The Strange Color of Your Body's Tears) discuss the unique visual style and atmosphere of Mario Bava's Blood and Black Lace and highlight some of the key qualities of the giallo genre. In French, with optional English subtitles. (11 min). • Yellow (2012) - presented here is Ryan Haysom and Jon Britt's short neo-giallo film Yellow, which follows closely an elderly man looking for a serial killer in 1980s Berlin. Starring Hester Arden, Stephen M. Gilbert, and Rocco Menzel. In English, not subtitled. (26 min). • Gender and Giallo - in this visual essay, Michael Mackenzie takes a closer look at the origins of the giallo genre and the socio-political overtones found in some of the more popular giallo films. In English, not subtitled. (38 min). • Blood and Bava - presented here is a panel discussion featuring Dario Argento, Lamberto Bava, and Steve Della Casa. The three gentlemen discuss the filming of Inferno, Mario Bava's directing methods, the gap/misconceptions that separated the great classic Italian directors (Federico Fellini, Michelangelo Antonioni) and the Italian genre directors (Mario Bava, Dario Argento), etc. The discussion was recorded at the 2014 Courmayeur Film Festival. In Italian, with optional English subtitles. (12 min). • The Sinister Image - presented here is an archival episode of David Del Valle's TV series, which focuses on Cameron Mitchell (Max Marian in Blood and Black Lace) and his quite diverse body of work. The actor discusses his work in America and Italy, some of the more popular genre films he appeared, his work and interactions with such legends as Clark Gable, Spencer Tracy and Burt Lancaster, Mario Bava's directing methods (he appeared in six of his films), etc. In English, not subtitled. (57 min). • U.S. Opening - presented here is an alternative credit sequence created by Filmation for the U.S. release of Blood and Black Lace. The titles were sourced from Joe Dante's private print of Blood and Black Lace and scanned in high definition. (2 min). • Trailer - original Italian trailer for Blood and Black Lace. In Italian, with optional English subtitles. (4 min). Great releases from Arrow Video are always welcome. Thank you very much.